This article contains the stats, strategy, and guide for Archer - Arash. We will update this as soon as the game comes out. 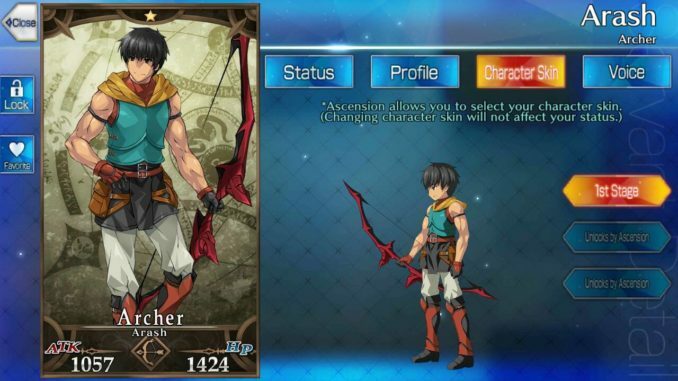 This article contains the skills, stats, growth, and ability of Arash of the Archer class from Fate Grand Order [FGO]. Arash chains best using a Buster-Arts-Quick arrangement. While the Buster deals heavy damage, it deals the least amount of hits. However, Arash does the best with either forming Quick Chains or Art Chains. When activating his Noble Phantasm, he’ll sacrifice his HP to heal other servants. This will then allow him to swap places with a much more powerful servant. This craft essence charges his NP instantly by 80%. This allows him to perform his NP on the first few turns especially if your party suffers from severe damage. However, this is a five star craft essence which means it has a low chance of dropping. Using this craft essence, this can easily wipe out an enemy team by boosting the NP damage by 40%. In doing so, not only does it replenish your servants’ HP for the next battle. This works as a substitute for Kaleidoscope as it has lower cost. This also allows you to place in a stronger servant to balance powers and attribute. Increases own poison resistance for 3 turns. Sacrifice self. – This cannot be prevent however it triggers Guts. Arash Kamangir is his Eastern Asian name. However, if translated into English or Western Asian, Arash translates into “Arash the Archer”. The archer often symbolized peace which was fitting for this particular hero. While he did participate in the war, he sought for nothing but peace on both sides. Working with King Manuchehr, Arash fought in the 60 year war between Iran and the Turks. As the war waged on, the king and his enemies decided to draw a border due to irreconcilable differences. However, a goddess instructed the king to construct a special bow and arrow. Its wielder would be Arash, one of his men. As the man fired the arrow, it landed such a great distance that this is what decided to borders between the Turks and Iran.